[#11151] - Using a JNDI DS for subreport ? I have a report (JNDI DataSource on JasperServer, PostGreSQL) with a subreport using a parameter for the connection expression, class : java.sql.Connection. For any reason I have now a permanent message in Studio and JasperServer on 2 environments: "java.sql.SQLException: No suitable driver found for jdbc:oracle..."
I didn't find any solution yet but I wonder how to use a JNDI DataSource from JasperServer for the subreport, as for the main report? I already have the JNDI DataSource on JasperServer for this 2nd Oracle database to connect to. The best I found is this article but I did not succeed (syntax error), any ideas please ? Thanks a lot for your answer. I added a property "com.jaspersoft.jrs.data.source" with value "repo:/Resources/DS/JNDI_Anemone" in my subreport. I understand the subreport will use this property as a default data source to retrieve data. 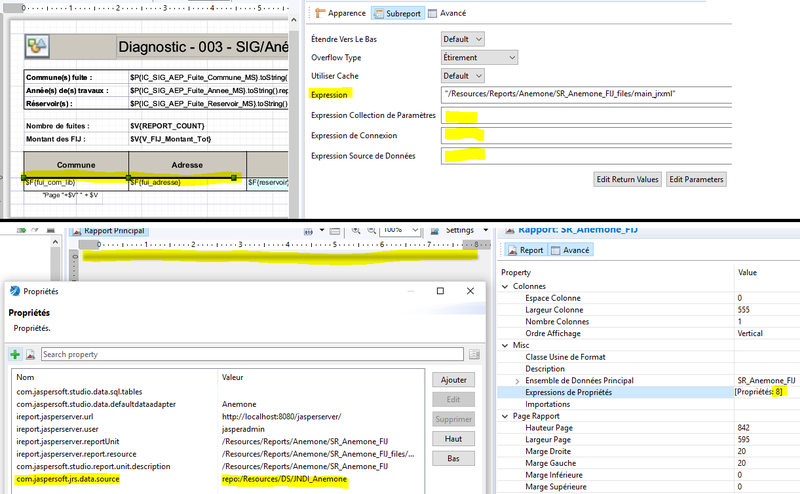 In the main report, on the subreport element, I just let the expression with the path of the report, but no "connexion expression" or "data source expression". If I understood correctly it should be ok this way and I have no error but I don't get back my numerical value from the subreport anymore. Are you running the report in JasperReports Server? Yes, I was thinking to always use the JNDI Datasources of JasperReports Server instead of hard coding the path in a parameter. - subreport without elements in it, but an added property "com.jaspersoft.jrs.data.source"
What JRS version are you using? Does the screenshot help ? Maybe I just didn't fill the properties properly ? The only alternative I have is to rebuild my report but I'm still convinced I can plug my subreport using a JNDI datasource of JRS !? I made a test with JRS 6.4.2 and setting com.jaspersoft.jrs.data.source on a subreport worked fine for me. I'm attaching my report, it uses the sample DBs (master report uses sugarcrm and the subreport uses foodmart JNDI). If you have a JRS instance with the sample DBs installed, import my report and check if it works. I'm not able to tell from the screenshots why it doesn't work for you, creating a test report with the sample DBs would be easier to investigate. Thank you Lucian for your test. How do you make a connection between the 2 dataset if you don't pass any parameter? Does it give you a clue ? Me again, I did more tests and I got more informations. In JasperReport Server, via the UI I set the parameters 'org.hibernate.SQL' and 'net.sf.jasperreports.engine.query.JRJdbcQueryExecuter' to DEBUG to see the value of the parameter for the subreport SQL request. I reopened my subreport and actually the property "com.jaspersoft.jrs.data.source" has gone. 7 properties instead of 8 a few seconds later! I did it twice, the property vanishes! I don't have an environment for now for these 2 last releases. I moved the subreport into a separate report unit and added a parameter and return value to it. It still works fine. If you think there's a bug, try creating a test case with the sample DBs so that we can reproduce it. Otherwise investigating the problem will be much more difficult. I runned your report and everything is ok. So I created a new (sub)report and added the property com.jaspersoft.jrs.data.source : "repo:/datasources/JServerJNDIDS"
Then I published it twice, once choosing the 'JServer JNDI Data Source', once choosing 'Don't use any Data Source'. In both cases, when I reopen the report from the repository the property is missing. And I have a property 'ireport.jasperserver.report.resource : /reports/SR_files/main_jrxml' you don't have in your. I see you also used JS 6.5.1 to create your reports, but which release of JRS ? I attached a screenshot with the 2 sets of properties. The property "com.jaspersoft.jrs.data.source" is always deleted once published on the repository! I didn't use Studio to design or publish the reports. If Studio removes the com.jaspersoft.jrs.data.source property, then there's indeed a problem. You think the problem is in Jasper Studio ? So JasperReports in JasperStudio would have a bug, and JRS is only stocking the report at this time ? You don't have the problem cause you use eclipse + jasper plug-in, do you ? I installed Eclipse 4.8.0 + jasper plug-in 6.6.0. I compared the 2 jrxml, yours and mine nothing special.. I used neither Studio nor the plugin, I edited the JRXML files in a text editor (starting from sample reports). My goal was to answer your question "... I wonder how to use a JNDI DataSource from JasperServer for the subreport, as for the main report?" My suggestion was to use the com.jaspersoft.jrs.data.source property, which as far as I know works properly in JasperReports Server. If Studio prevents you from uploading reports which use that property, I guess that it's a problem with Studio. I don't know that much about Studio, so I'll let other people have a say. I miss something, how do you publish your report so ? I did a last test, your report and subreport works fine, so I deleted the property from your subreport, published it, reopened it, added the property, published again and reopened it : the property has gone. Anyone is using subreport with JNDI DataSource ? I'd be really surprised.. I published the reports via the JasperReports Server web UI. Ok, this is why it worked when I imported your reports. If I do the same my report 'should' run ok then. I'm out for a week, I'll test as soon as I can. If it works there is a workaround. Do you think this bug, concerning at least Jasper Studio & Jasper plug-in 6.5.0 and 6.6.0, has a chance to be attached to the next release ? Just to let you know that, as Lucian said, the only workaround is to use the JasperReports Server web UI to export, fix then import your subreports. This because of the property "<property name="com.jaspersoft.jrs.data.source" value="repo:/Resources/DS/JNDI_xxx"/> you have to add within the xml of your subreport. Is there a special request to do for this bug to be considered ?